Spring is finally here and as we approach the second anniversary of albertapatients.ca it is great to see that the community is thriving and engaging in important conversations about health care. This month we are pleased to bring you the results of a recent survey regarding your experiences in primary care. There are many things you like about the care you receive in the community from family physicians and primary care networks (PCNs). There are also things you would like to improve. It’s all interesting reading and I hope you will enjoy reviewing the report. We will be sharing it with primary care physician leaders and the board of the Alberta Medical Association as well as others in government and Alberta Health Services. Your participation is helping to build a better health care system. We are planning some exciting new areas to explore in the months ahead to begin our third year as a community. Thanks for coming along for the ride and stay tuned! 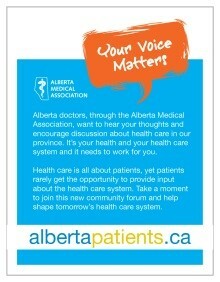 We asked albertapatients members about their views on and experiences with primary care in Alberta. Please read on to the Did You Know section (below) for highlights from that research and a link to the full report. Patient views on primary care in Alberta. Did you know? Patient satisfaction is significantly higher among those who see a single family doctor than those who are relying on more than one family doctor. Looking at physician key performance indicators, 74% of patients with a single family doctor rate the overall care and service received as Excellent or Very Good (compared to 48% of patients seeing more than one doctor), only 23% are likely to switch from their family doctor (compared to 60% of those seeing multiple doctors), and 67% are likely to recommend their doctor (compared to 36% of those receiving care from more than one doctor). 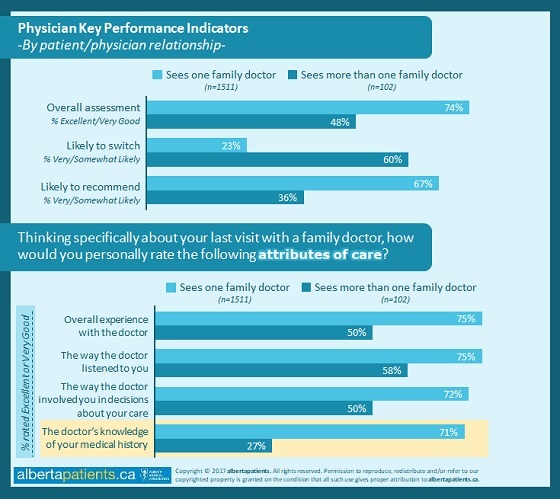 Additionally, those seeing one family doctor rate specific attributes of care – particularly the doctor’s knowledge of their personal medical history – more positively (71% Excellent/Very Good) than those who receive care from a group of doctors (27% Excellent/Very Good). 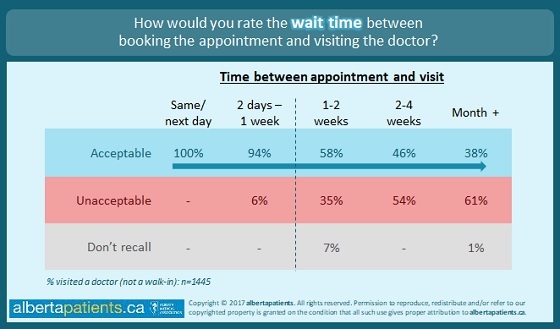 Of those booking with appointments, 75% of patients say the wait time between booking and seeing a family physician last time was acceptable. Based on last visit, almost one-half (47%) can see a family physician within a week (if appointment sought), while 11% opt for walk-in, and a sizable minority wait longer than a week. From patients’ perspectives, one week appears an important line of demarcation: “acceptability” of delay falls off sharply if patients needed to wait more than a week to see the doctor. Delays in a family practitioners' office are inevitable, but managing these waits is extremely important as they have significant impacts on patient satisfaction. 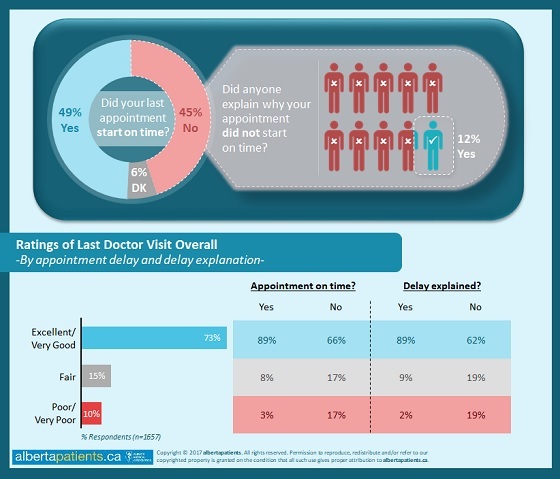 When asked about their last visit to a family doctor, fully 45% of patients who had a scheduled appointment say their visit did not start on time. Of those patients who experienced a delay, 66% feel positively about their “overall experience with the doctor” (compared to nearly 9 in 10 (89%) of those whose appointments started on-time) and only 12% report that someone from the doctor’s office (staff or doctor) offered an explanation for why the visit did not start on time. Among those who received an explanation for the delay, satisfaction with the experience climbs to 89% “Excellent/Very good” vs. 62% satisfaction among those who did not receive an explanation.